Firstly, apologies for the lack of recent updates to the blog – we’ve been quite busy! Now, onto the main news for the moment. Things are changing here at DPS Computing. As director of DPS Computing Limited I have decided to revert DPS Computing back to a sole trader business. The effects to our clients and visitors should be minimal, if anything at all. DPS Computing is still going to provide the same services that it provides at the moment (including the blog). The only change is that we are once more going to be trading as an independent trader as opposed to a limited company. Firstly, due to external opportunities that became available to myself, I am no longer able to put in full time hours at DPS Computing. However, I am still involved in DPS Computing and working on its different products and services. Any changes to products and services will be communicated via the website and directly to any current clients of our products or services. Secondly, due to the fact that I am no longer working full time at DPS Computing, I want all the time that I put into DPS to be spent developing products and services, maintaining and supporting them, answering customer queries and providing a good quality service. If I continued to run DPS as a limited company then a significant proportion of time would be taken by admin, taking away from the actual products and services that we provide. Bearing this in mind, as I am not working full time at DPS Computing, becoming an independent trader once more will allow DPS to provide you with better products and services. Thirdly, we will be able to streamline our business model for the benefit of our customers. In conclusion, DPS Computing Limited is undergoing transition back to DPS Computing. However, we’re still going to be here! (just like we were when we made the transition to a limited company). You may notice changes to the website over the coming weeks and months due to the transition. If you have any questions or queries please feel free to contact me. I’d personally like to thank all our current clients, members and visitors for their continuing support and I hope that I can rely on your continuing support. DPS Drive – Case Study Examples (CSE) Launches With First Case Study! DPS Computing Limited is proud to announce the launch of the brand new (and free!) DPS Drive – Case Study Examples (CSE) package. The first case study in CSE has gone live this evening. DPS Drive – Case Study Examples is aimed to complement DPS Drive – Interactive Theory Test (ITT), released this summer by DPS Computing Limited. While the interactive theory test helps learner drivers get to grips with the driving theory and the types of questions that are asked during a theory test, DPS Drive – CSE puts the questions into a context and format that you can expect to be similar to that faced in the theory test centre. The first Case Study Example contained in DPS Drive – CSE has been provided and kindly licensed to DPS Computing Limited by the Driving Standards Agency. DPS Computing Limited is working with fully qualified Advanced Driving Instructors (ADIs) to create more realistic case study examples to enable us to continue releasing more case studies at regular intervals. DPS Drive – Case Study Examples is the second release by DPS Computing Limited, as well as the second release in the DPS Drive line of products. 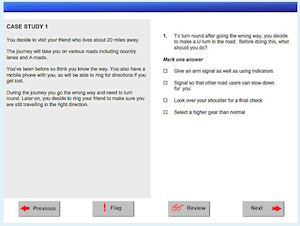 While DPS Drive – Case Study Examples (CSE) was initially conceived as a paid for add on to DPS Drive – Interactive Theory Test, the decision was made to release it under a free-to-use model. There are a number of advantages to this. Firstly, you get it for no additional cost (always a bonus!). Secondly, it is accessible to both current DPS Drive – ITT (DPS Computing) customers and non customers alike. Thirdly, by releasing it under a free-to-use model we can release case studies as and when they are finished and become available. Under the pay model, we would have had to complete all of the case studies prior to release, thereby delaying the release date. DPS Drive – Interactive Theory Test (ITT) and DPS Drive – Case Study Examples (CSE) have naturally been designed to complement each other. You can access DPS Drive – CSE here. Next Product In DPS Drive Lineup Revealed – FREE Case Studies! Following up on the release of DPS Drive – Interactive Theory Test (ITT), DPS Computing Limited is proud to announce the next product in the DPS Drive lineup, named DPS Drive – Case Study Examples (CSE for short!). DPS Drive – CSE will include case studies that are typically found within the theory test that you take while learning to drive. “On 7th May 2008, the Rt Hon Ruth Kelly, MP, Secretary of State for Transport launched the Learning to Drive public consultation, setting out proposals to reform the way that people learn to drive and are tested. The consultation closed on 6th October 2008 with almost 7,000 responses. The Report on Consultation explained Ministers’ decisions about the package of changes on which we consulted. There was widespread, strong agreement that the introduction of case studies into the theory test would help to better assess whether learns have understood driving theory. As with the theory test questions featured in the Interactive Theory Test, the DSA no longer release the live question banks that are actually in use. This is the same for case studies. The theory test questions and case studies are indicative of the type that you would face in your theory test, but are not the actual questions / case studies – as with all revision materials out there (even the DSA’s own official revision materials). DPS Drive – CSE will at first include one case study, which has been licensed to DPS Computing Limited by the DSA. However, DPS Computing Limited is working closely with Advanced Driving Instructors to create more case studies to include in DPS Drive – Case Study Examples. And the best part? Well we’ve saved that till last! DPS Drive – Case Study Examples (CSE) will be available free of charge! Therefore DPS Drive – CSE will be available to both customers and non-customers, however it is designed to complement DPS Drive – Interactive Theory Test (ITT) and will be geared in a way that complements the Interactive Theory Test software – which we highly recommend for your revision! Anyone who uses the Internet will be used to spam, far too used to it in many cases. There seems to be a never ending attack on our inboxes with unsolicited emails. However, spammers are getting more clever, attempting to deceive people into believing that the spam they are sending isn’t actually spam at all. In light of this, DPS Computing Limited is launching a new service called Spampository. Inside Spampository we are going to collect spam e-mails along with our analysis of these e-mails. Where relevant, we will also include a screenshot of the spam e-mail so that you know what a typical sample of it looks like – for example, if they’ve copied a template from an official website in an attempt to deceive recipients. We hope this will benefit many of our readers and members as well as people on the Internet in general. We will collect suspected spam, analyse it and offer advice. If you receive a spam e-mail you will be able to check it against the entries in the Spampository and see if we have a record of it and then, using the information and analysis we provide, you can have assistance in deciding whether the e-mail is spam or not. Some spam e-mails now contain personalised information to make the e-mail seem legitimate and spamming inboxes can be so lucrative for some criminal organisations that they will actually employ people to create spam to fool spam filters, and sometimes the email recipient. The Spampository entries will feature on the DPS Computing blog (here!) – but don’t worry, we’re excluding the entries from the blog homepage so that it doesn’t clog up the blog! To view the Spampository entries simply click on the ‘Spampository’ category on the right hand side of the page. Unfortunately, many people still fall for, what can sometimes be, extremely convincing spam e-mails. Our aim with Spampository is to help the fight against spammers and to offer professional advice to our members, readers and Internet users in general. If you have any spam e-mail that we haven’t contained in our Spampository and you would like us to feature it in there, then feel free to forward it to us at spam@dpscomputing.com – we’ll try to feature as many as we possibly can!